Following yesterday’s wet/dry qualifying session Alexander Rossi was starting today’s 28 lap Feature Race from 3rd on the grid after a very impressive performance in the difficult conditions while Jordan King, who had been hampered by a vibration in the front of his car when the track was at its best, had been 14th but a five grid penalty carried over from Monza meant he would be starting from 19th. Once again the Russian weather was cool with air and track temperatures of 15° and 23° respectively and there were dark clouds overhead. Most of the cars, including the Racing Engineering drivers, were starting on the soft compound Pirelli tyres. As the lights went off Alexander made a great start to move up to second as he passed Vandoorne but Jordan made contact with another car and then hit the barrier as a result of the damage he had sustained. Meanwhile Markelo! v went off track and hit the wall as he tried to return to the circuit causing several cars to crash so the race was red flagged as the marshalls removed the damaged cars from the track and repaired the barriers. Racing resumed behind the Safety Car after a thirty five minute delay with the race distance reduced to 15 laps. The Safety Car returned to the pits after two laps and, as the cars got up to speed Alexander held his second place behind Lynn and ahead of Pic. On lap five the young American was three seconds behind Lynn but 1.3 seconds ahead of Pic and, as the DAMS car took its mandatory pitstop, the Racing Engineering car took the lead setting the fastest lap of the race so far with a time of 1:47.657s. Alexander pitted on lap 8 resuming the race right behind Lynn in what was effectively the battle for the lead. With five laps to go Alexander, on the medium compound tyres, was battling hard with Gasly who was on the soft compound tyres with Lynn just ahead. With three laps remaining Lynn was out of the race after leaving the track at Turn 13 and damaging his car so it was now a battle for the lead between Alexander, Gasly and Vandoorne who had made a late pitstop. With two laps remaining the Racing Engineering car led the DAMS car by 0.7 seconds but he quickly pulled away to win the race by 3.1 seconds. Following his superb win today Alexander will start tomorrow’s Sprint Race from 8th on the reversed grid while Jordan, following his retirement will have to start from the rear of the grid. Alexander will be looking for another podium finish and Jordan will be trying as hard as ever to get into the points. "We are delighted with Alex’ result from today, another Feature Race win is very positive for him and the team. It was difficult today due to the conditions, the red flag and obviously the reduced race distance due to the light fading away. This affected the strategy you approach a race with under normal circumstances. But Alex drove well and the pace of the car was there, so we were able to gain another win that he and the team deserve, we are very happy about this. Unfortunately we were not able to see both our cars cross the finish line. Jordan had contact in the first corner, misjudging his braking a little and he lost his front wing and damaged the car. This resulted in him crashing into the barriers at Turn 3 and he heavily damaged his car. The most important ! thing, however, is that Jordan is fine and he is only complaining about a bit of pain in his hands, but he is positive that he will be fine tomorrow. The strong impact resulted in Jordan’s chassis being broken, so we will have a long night and we’ll have to work hard to have his car ready by tomorrow morning." "My start was pretty good and I got a couple of people off the line. I had a bit of contact in turn 1, and then, going into turn 3, I wasn’t aware that there was actually big damage to the car, the damage sustained got worse and something broke and I went straight on into the barrier. It was quite a big impact, but I should be OK to race tomorrow. We will see how I feel in the morning." "Today was good. First of all I am glad that Jordan is OK as that was a difficult first lap. It was a bit of a strange race with it having it been so short and in the end I think we have done a very good job. We only have to understand why Lynn was so much quicker than us after the safety car restart, because once he opened up this gap, it was quite difficult to close it down, but I think we had a pace advantage on everyone else. I just don’t know why he was so quick, so we need to understand that. From there the race got quite difficult, because Gasly was coming on the options towards the end of the race, we had to make sure we had a big enough gap because he had DRS on us as well so I think it’s a testament on how quick the car was. Racing Engineering are ready for action in Spa after the mid-season break. A very disappointing Sprint race for Racing Engineering at the Hungaroring. Jordan King finishes sixth today at the Hungaroring. Jordan King qualifies sixth today at the Hungaroring. 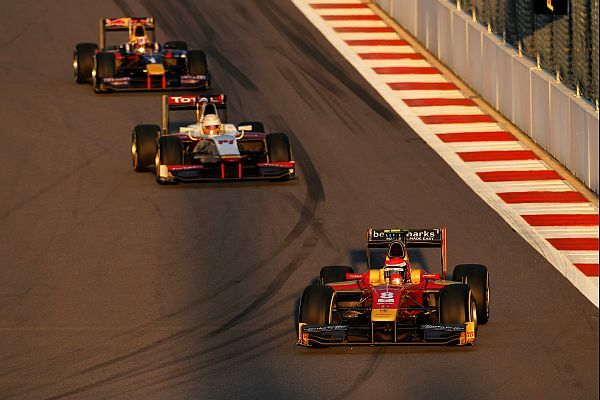 Round six of the 2015 GP2 Series sees Racing Engineering in Hungary. Alexander Rossi fourth today in the Silverstone Sprint Race.